They’ll feel the energy of this stylish, nicely priced promotional pen! This retractable writer really makes your logo pop. The bright translucent barrel coordinates with the opaque rubber comfort grip and curved solid-hue clip. Plunger and pen tip are shiny silver. 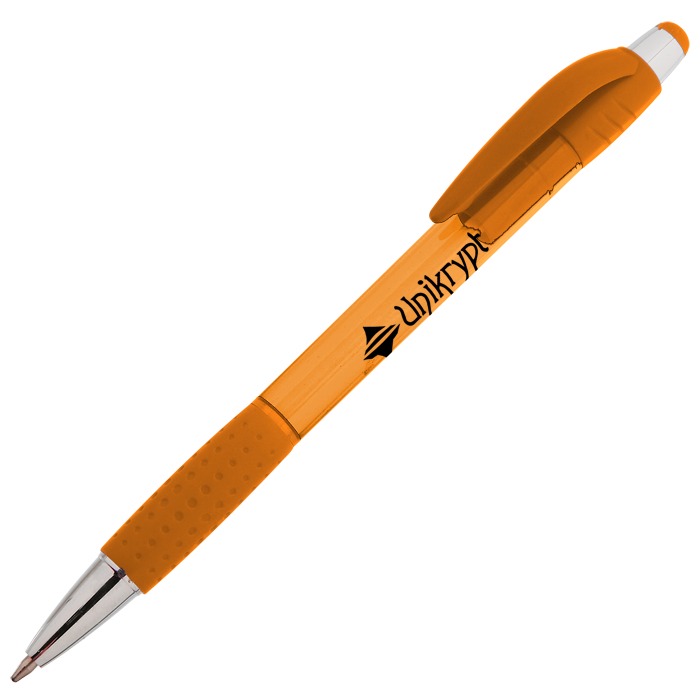 Plunger is also accented with a colored tip that matches the rest of this retractable ballpoint. If you need this item faster, see item #9630-24HRKrypton Pen - 24 hr for our 24HR service. For the silver barrel color options, see item #9630-SILKrypton Pen - Silver for standard shipping and #9630-SIL-24HRKrypton Pen - Silver - 24 hr for 24HR service. Your price includes a one-color imprint on the barrel, next to the clip.